I take the solemn responsibility of charging the Prime minister with a particular specific war crime and high misdemeanour. She gave the orders pre-lunch at Chequers on Sunday, 2 May 1982 for HMS Conqueror to unleash its Mark 8 torpedoes against the Belgrano, behind the back of her foreign Secretary, without consulting our allies, the American Government, in the knowledge that the Belgrano and her escorts were at that time no conceivable threat to the task force and in the knowledge that Galtieri had ordered the withdrawal of the army from the Falklands-Malvinas on the evening of Saturday, 1 May, on the basis of the Peruvian-American United Nations Peace terms. (Thatcher’s Torpedo, p.37). That settles it! This central fact kept being categorically denied through the Government’s FAC Report of 1985.
my honourable friend Tam Dalyell, who I believe will go down when the history of the period is written as a man who would not be deflected from what he saw as his duty and who has uncovered a whole series of facts which should be known to the public. 4 am SAT (8 am BST) Sandy Woodward head of Task Force sends instruction to Conqueror to sink Belgrano. 6.15 am SAT (10.15 am BST) Northwoods countermands this instruction, that Conqueror is ‘not to attack Belgrano, unless or until ROE (Rules of Engagement) are changed. 9.15 am SAT (1.15 pm BST) Permission to ‘sink anything’ given by ‘War Cabinet’ at Chequers to Lord Lewin – kept a secret for two years, until MOD documents were leaked to Dalyell by Clive Ponting. This slippery tale has that last signal reactivating the earlier command given to the submarine commander, to sink the Belgrano – and that was all. That is rather far from the truth, as we know both from statements given by the submarine Commander Wrenford Brown at Faslane to Scottish newspapers (picked up by Dalyell) and also from what was written in the Conqueror log book. It was sunk ‘on instructions from Northwood’ – repeated instructions, as the Commander could not at first believe it. The Government’s story, as retold by Sir Lawrence Freedman in his Official History of the war, requires us to believe in the PM’s ignorance of two or three interlinked facts; first that the entire Argentine navy was sailing home and had been since before dawn; and second, that the reason they were sailing home was a peace treaty agreed upon and ready to sign, a result of intense activity by Peruvian, American, Argentine and British sources over the weekend. 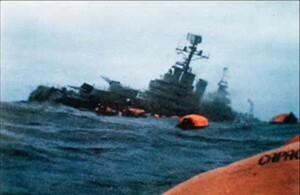 The latter went very quiet after the sinking but enough evidence remains to indicate their participation: in other words, the Belgrano was sunk at the latest possible moment for knowledge of that peace treaty (and homeward-bound journey of the Argentine fleet) to be officially-deniable. The question here is: do you really want to believe that British intel could be as bad as that? And that in turn reflects upon the function of GCHQ at Cheltenham. Also, as regards claims of ignorance that the Belgrano had reversed direction eleven hours before being sunk – that it was sailing West not East, away from the Task Force and not towards it – let’s recall that so too had the Conqueror, because it was tailing her. As regards the Peruvian testimony, of having a list of phone calls demonstrating contact with British sources over the weekend of 1-2 May, concerning the very productive peace negotiations – which were assuredly helped if not catalysed by the stern words of disapproval from President Reagan over Argentine machismo, plus the tough impact of US economic sanctions on Argentina – President Belaunde of Peru did alas make it clear that this could only be released following a formal request from the British Labour party. As Ian Mikado explained to the Belgrano Inquiry, their ‘minority report’ committee tried to move Britain’s Labour Party to make that request to Peru – but, it just wouldn’t. CONGRATULATED Thatcher on her conduct of the war – earning a scornful reply from the Iron Lady. That is bilateral war-support! As Tony Benn often remarks, in war the first casualty is truth. The Times published Dalyell’s claim, that Thatcher was at Northwoods in the late afternoon of May 2nd. (24.9.84) This was officially denied. But, what else could she have been doing – having tea with Dennis?